Given the ever-increasing growth of digital media; there is a constant demand for skilled digital marketing professionals. While certifications, education, and training look great on a resume, a focus on the soft skills topics and areas are also an important way to differentiate you from the rest of the pack. Working within a digital marketing team without solid social skills can be a disaster. If you work with social media in any capacity, you need special social skills to understand how individuals communicate with one another so you can create the most engaging content. While your digital marketers may not be closing deals directly, they need to know how to sell or they’ll be wasting your valuable marketing dollars without generating qualified lead opportunities for your sales team. Digital marketing requires both creative thinking and analytical thinking. Many new candidates want to focus purely on one or the other, but it’s important to bring “art and science” to each digital program. Digital marketing has some rules and these rules keep changing from time to time. You have to be a quick learner and also you should be able to use the knowledge acquired in practice. This job position requires a significant amount of communicating with other people on the team, explaining highly complex digital and tech topics, presenting data and research to non-tech-oriented audiences, and describing the business benefits of a certain project in terms that everyone can understand. There could be different views on multitasking but given the real-time working of digital media and the number of factors that affect results in this media, having multitasking skills will benefit in leveraging digital media in your favour. Digital media knows no boundaries but it puts some restrictions to maintain the dignity of the media otherwise there is no limitation on using creativity and experiment with new ideas of communication. Technology is the backbone of digital marketing. It is difficult to think of running a campaign without using tools that can help in monitoring the success of campaigns. The tech industry is in a constant state of change. As such, professionals absolutely must engage in continuing education. 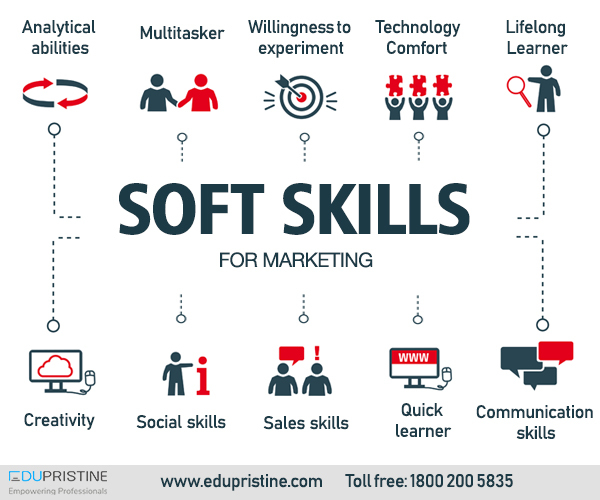 Hence, given the dynamic nature of digital media, one should have the above mentioned soft skills to be successful in leveraging digital marketing. While it is impossible to expect all of these skills in one person, the degree to which you have command over these soft skills topics is the degree to which you can expect success in digital marketing. Do you agree with the above soft skills? If yes, log on to edupristine to know more.